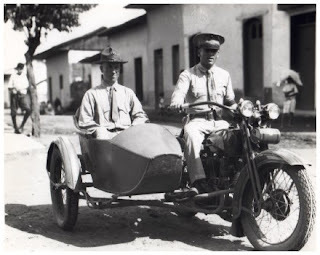 The sidecar, #5 in my "Embury six" series. 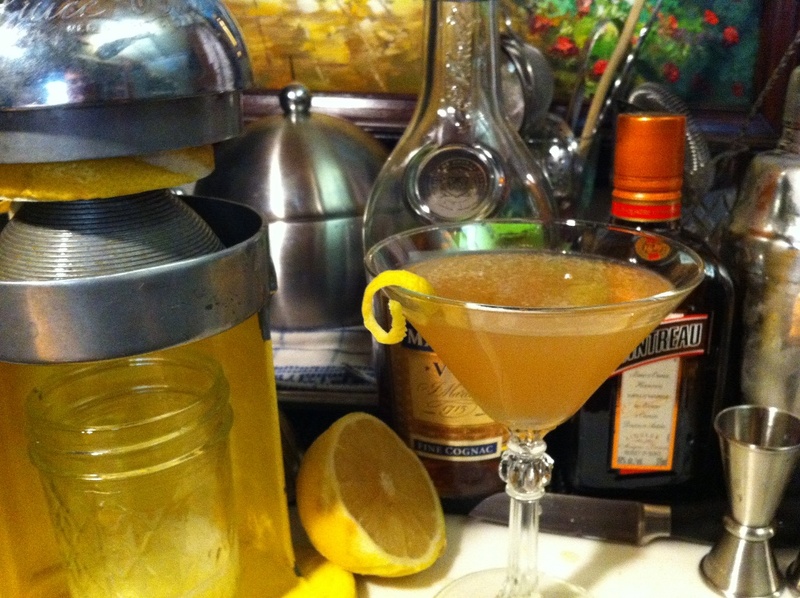 The sidecar was presented by Embury as the classic "must know" brandy drink. Here the choice of cognac or brandy used, and it's flavor profile, drive the proportions of the other ingredients. Brandy is an ancient spirit, with roots going back to the 12th century. The word brandy is a shortening of "brandywine", which in turn is a derivative from the Dutch word "brandewijn" (which means "burnt wine"). Brandy is certainly my weakest area of knowledge when it comes to the spirit world. I've tended to avoid the whole category and looked to other (and in my mind safer) alternatives to brandy. It's hard to blame anyone for these thoughts after growing up with such disasters as peach brandy, blackberry brandy and the many other artificially created frankensteins that have become popular in the last 50 years. The more I learn about the "burnt wine", the easier it has become to finally be able to enjoy it. Armagnac was the first distilled spirit in France, and is made only in the Armagnac region in Southwest of France. It is "single-continuous" distilled in copper stills, and aged in oaken casks from Limousin or Gascony. Cognac is a term only applied to grape brandy made in the Cognac region of France, and is double distilled in pot stills...and Cognac is what is called for in the original sidecar recipes (along with Cointreau and lemon juice). The origins of this drink are just as unclear as the first four in the "Embury six" that I have explored. There are two main "origin" stories for this one. There is the "Paris School" and the "London School", each with their own recipe, which I will explore in greater depth later. A third option, worth keeping in mind, was presented by Dale Degroff in his book "Essential Cocktail". Dale points out that the word sidecar in the cocktail world refers to a small glass or shot glass that the bar tender keeps for "over-pours". When they miss their mark on their ingredients, and end up with a little left over, they would pour the extra into the "sidecar". This drink bears a strong resemblance to the "Brandy Crusta", (which hails from New Orleans, and is accredited to a well known Spanish caterer by the name of Joseph Santini around 1852.) There are differences, the crusta calls for bitters and sometimes maraschino and has a sugared rim. Even today, some sidecar recipes include instructions for the sugared rim as part of the garnish. If bartenders of the day found that the crusta was one of their favorite "overpours" to end up in their "side cars", then it's not too much of a stretch to think that this could be the actual origin of the name. Since were on a historical journey, let's go ahead and take a look at the two main schools of thought anyway. The more well known of the two schools, this story has many variables. Sometime in Paris, during or shortly after World War I, an American Army captain often traveled around in a motorcycle sidecar. 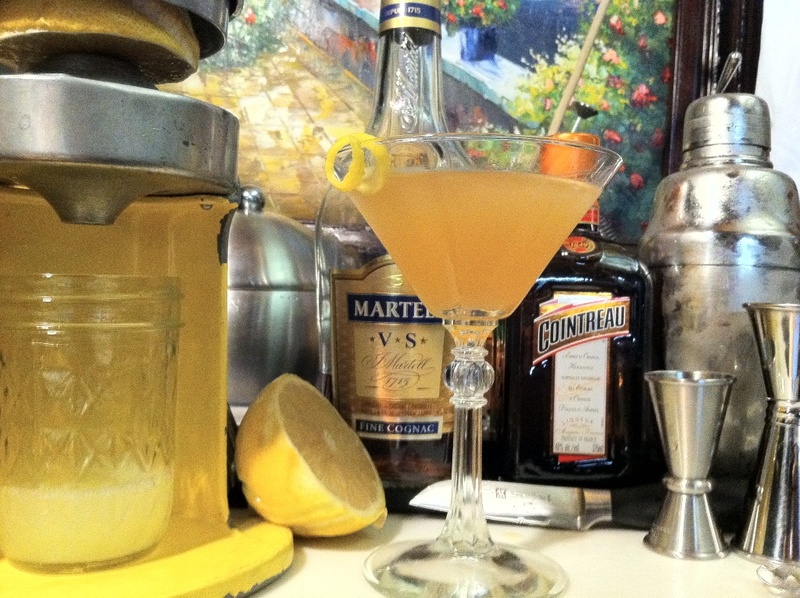 One day, when he was under the weather, he requested something that would help him feel better, and the drink was named the "Sidecar", as a tribute to its original patron. 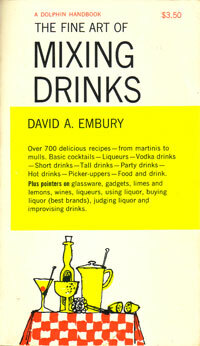 Embury also credits the invention of the drink to an American Army captain in Paris during World War I. 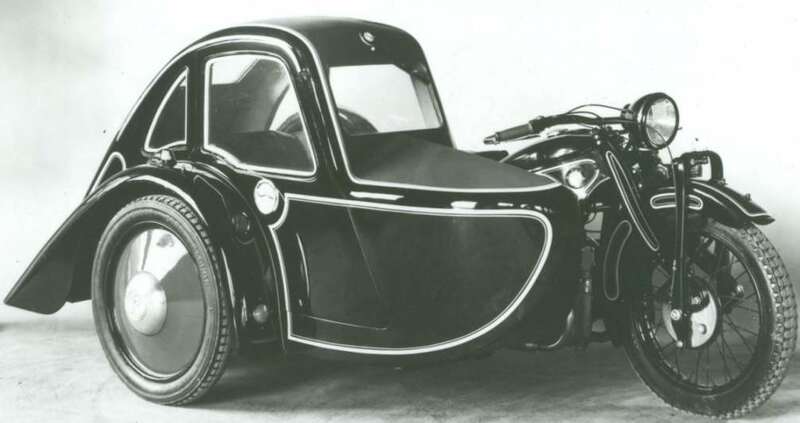 He also claimed that the drink was named after the motorcycle sidecar, in which the good captain was driven to and from the little bistro where the drink was born and christened". I've also read that the captain had the driver bring the motorcycle right up to the bar to order! It then seems to evolve into the captain going to the Ritz Hotel on a regular basis, and this was his favorite drink to ward off the chill of the winter nights. This theory was dramatized in a recent Cointreau advert. For me, the fact that there is no name associated with the captain, and that there are so many versions of the story out there, it smacks more of legend than fact. This is the earliest known recipe, and it appeared in two books published in 1922; Robert Vermeire's "Cocktails and How to Mix Them", and Harry MacElhone's Harry's "ABC of Mixing Cocktails". 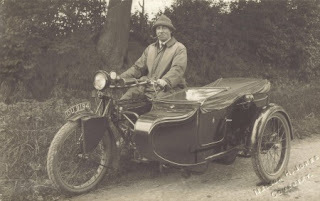 The story here, is that the sidecar was created at the London Buck's Club in the 1920's. It is most often credited to Pat MacGarry, who was one of the Buck Club's well known bartenders at the time. Interestingly, in early editions of "ABC of Mixing Cocktails", MacElhone cites the inventor as Pat MacGarry, "the Popular bar-tender at Buck's Club, London" but in later editions, he cites himself. MacGarry, the celebrated bar-tender of Buck's Club." So. you have the two books publishing the recipe for the first time using the Paris School recipe, but pointing to the founder of the "London School" as the originator. Isn't that a bit of a sticky wicket. Embury cites the motorcycle sidecar in France theory as the origin, but goes on to change the ratio of the drink to that of his daiquiri, or 8:2:1 ratio, making for a very dry, and much less sweet cocktail. His view was that this drink was a daiquiri with Brandy, replacing the rum, lemon replacing the lime (lemons and limes were interchangeable ingredients for some time) and Cointreau replacing the sugar or simple syrup as the sweetener. Over the twentieth century a sugared rim, triple sec and even concentrated lime juice have been called for in the recipe. 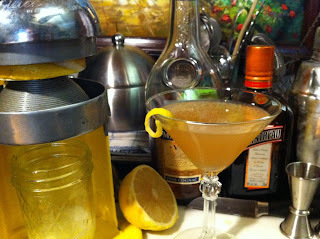 The official IBA recipe follows the "Paris school" recipe and calls for the sugared rim, and lemon rind as the garnish. 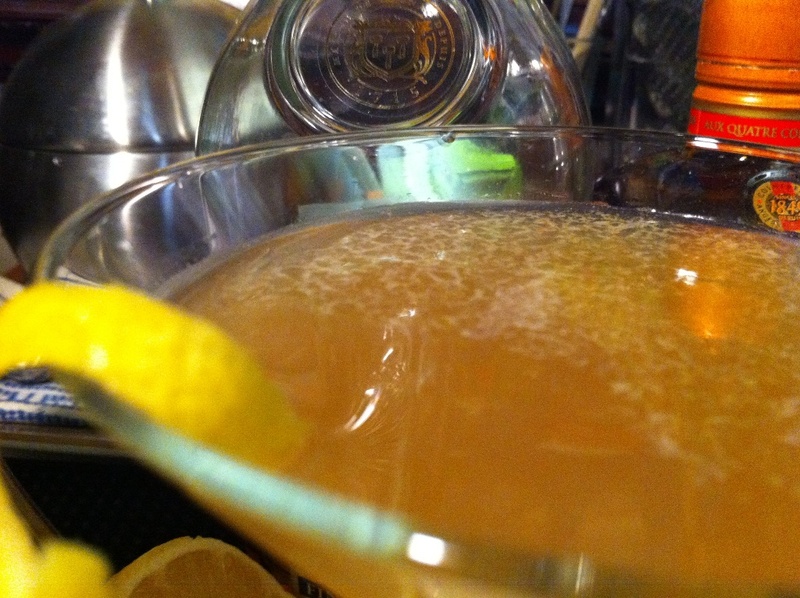 Though not commonly ordered, many bars have the sidecar or a variation on their menu. The current Death & Company menu (one of the most imitated in the world) lists a sidecar variation with the addition of Orchard Pear brandy and Benedictine. as well as this variation from his book "Vintage Spirits and Forgotton Cocktails"
"Shake in iced cocktail shaker, strain tremulously in to chilled cocktail glass." garnish: serve in glass rubbed with lemon juice and dipped in sugar. So....this is obviously a drink to play with, considering that the best minds in the cocktail world, past and present, have been unable to agree on a formula. Ted Haigh points out in "Vintage Spirits and Forgotten Cocktails" that "The beauty of this cocktail is that if it is too strong you just decrease the brandy. Too sweet? Add more lemon juice. Too sour? Add more Cointreau." Garry Reagan makes his point in the "Joy of Mixology" that since there is so much variance in the cognac and brandy worlds, it's impossible to have "one true recipe". Take his example of Courvoiser vs. Hennessy, the former being "sweet, round and plump" and the latter needing more triple sec and just a tad more lemon juice to balance out. My advice? Skip the sugar rim and garnish with a lemon peel. Use the Paris School (1:1:1) for the drier cognacs like Hennessy the London School (2:1:1) for the and sweeter cognacs like Courvoiser as your starting points. Play with the ratios until you dial in a flavor profile that you enjoy.